Just a note to make thing weirder. I cannot right click on the add-folder in my documents and have to option to create a NEW folder inside. The option is no longer available. Elaine. FYI, I did install P3d last month and got MTX to work using the simobjects method. I removed P3D from my machine and then reinstalled it again. Now I can't get it to work. 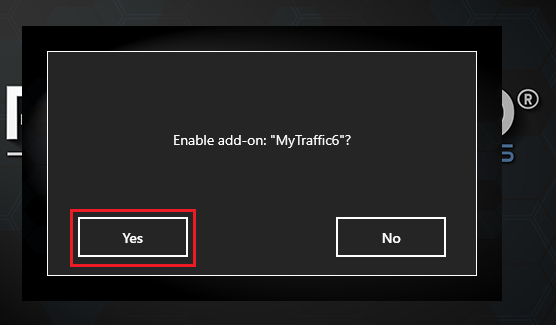 Did Prepar3D ask you to Enable MyTraffic 6 when you launched it, Did you see the Image below ? Yes, and yes. When I go to Options, Add-ons and add MTX6, I get a message saying it can't find the file. FYI, I was or am a beta tester for MTX, so I do know most of the aspects of the app. Haven't heard much from Burkhard for a couple of years now. How do we add attachments using this forum? When I go to Options, Add-ons and add MTX6, I get a message saying it can't find the file. 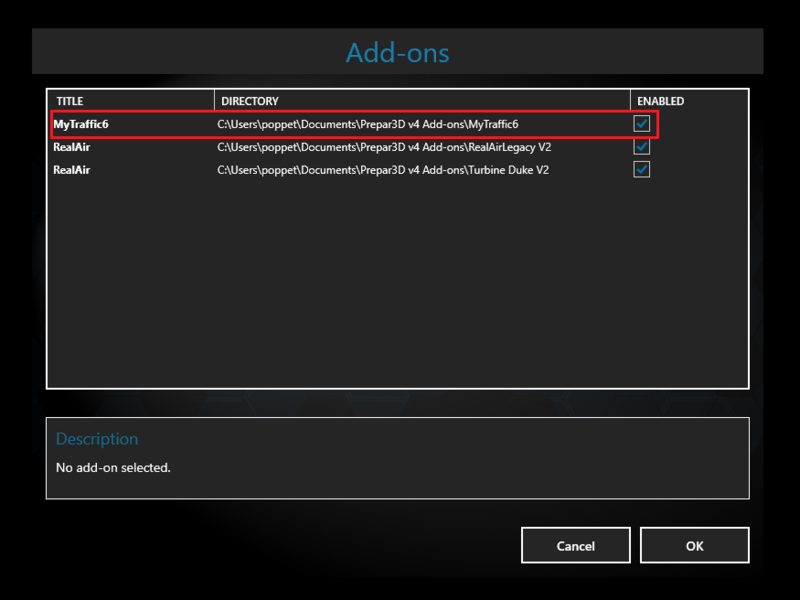 Just to confirm, Additionally to the add-on.xml file are you trying to add to the Scenery Library as well ? Click on link below, Is this the Options - Add On's you are referring to in your post ? Will the box not Tick for you ? No I am not. I can add it with the check mark and then click ok and nothing happens. If I close P3D and load again, I get a message saying it cannot find that file and would I like to unload it. Hi Elaine. It is not in either one. Here's the cfg file. Would like to unload this area? Click and Drag your add-on.xml file out of the Prepar3D v4 Add-On's folder and onto your Desktop, Now launch Prepar3D, do you still see the message ? Navigate to your MyTraffic 6 Install location, does the path look like the below Red box ? I don't get the message when I start P3D. 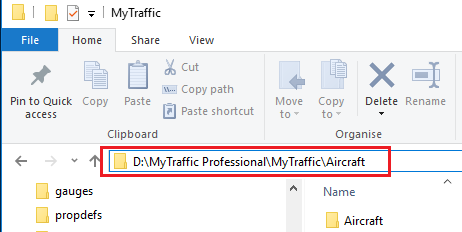 MyTraffic folder looks like this. They are two separate folders with the MyTraffic folder containing the app. Was this a Default Install ? Or did you create a folder to Install MyTraffic 6 to ?